I am not convinced that penalties should take effect in the race following the one in which the offense was committed. It strikes me that this has two undesirable effects - that the second race is unnaturally affected by a driver striving to lessen the effect of his penalty and that the system is open to abuse for the purpose of race fixing. The fact that a driver dropped ten places down the grid will have to fight his way back up the field is often suggested as a benefit to these delayed penalties, thereby giving more entertainment value to the fans. But it is an artificial injection of excitement, similar to the idea of reversed grids, and would no longer be valid if overtaking were not so difficult as at present. There is also the variable nature of such penalties, sometimes resulting in none at all if the driver is able to force his way to the front in spite of a grid penalty. As we have seen recently with Hamilton's ten-spot penalty in France, the effect on the penalized driver can be to induce a feeling of having nothing to lose, encouraging dangerous overtaking moves and increasing the risk of accidents. This spreads the possible effects of the penalty to other drivers, since they could be taken out of the race by a badly-timed move by a driver coming through the pack. If we are so concerned about safety, why penalize in a way that increases the risk to drivers who were not involved in the original offense? I suspect that these grid penalties have become so popular because they are an easy way to shuffle the grid and so disguise the fact that modern F1 has so few passing maneuvers. Has the show become so all-important that it is necessary to hide the processional nature of races brought on by restrictive rules and modern circuit design? Surely the governing body should be doing all it can to tackle the problem at its roots, rather than attempt cosmetic solutions such as delayed grid penalties? And that brings me to the matter of race fixing. The most blatant example of the FIA trying to keep a championship alive was the 2006 ban on mass dampers, obviously designed to prevent Renault and Alonso from running away with the titles. But there have been other instances where it has looked as though sudden rule changes were introduced with the intention of affecting the championship. The spread of delayed grid penalties only increases the opportunities for officials to meddle with what is happening on the track; they need only await their opportunity to hobble anyone performing too well. It seems to me that penalties should fit the offense and should not be open to change by performance in the following race, whether spectacular or disastrous. If a driver has done wrong, he should be dealt with promptly and fairly, without the possibility of escaping altogether. The FIA does fine drivers on occasion but this, too, is not ideal, since their earning capacity varies so much. Perhaps the fairest way would be to dock points from those already scored, although this means that drivers who have scored no points effectively escape punishment. This matters less once we take into account the fact that such drivers are usually at the back of the grid and grid penalties become meaningless for them anyway. Of course, a system involving points deduction is open to abuse too but it would be more obvious if applied clumsily - and the FIA are not noted for their subtlety in such things. More importantly, it would enable penalties to be set out in advance so that everyone would know just how much each offense would cost. And we would avoid this business of races being affected by the previous race, something that strikes me as being unfair and unnatural. Let each race start with a fresh slate for everyone - that seems to me the way to go. interesting. i'd take it a bit further though. i like the idea of offenses falling into certain categories and penalties set depending on the severity of the offence, but apply a time penalty instead of points deductions. that way even non point scorers would have a fair penalty applied. it does make me wonder about appeals, though. it's already dicey to appeal and the fia could be even more inclined to extreme predjudice if a team turns down the lessor time penalty. I couldn't agree more, as when a race weekend is approaching and you know that one (or more) of the top drivers are going to start 10 places back I never relish the race as much as usual, especially with the whole grid being so close this season. Also the clumsiness in applying these is getting increasingly ridiculous especially, such as the addition of the "free engine change" rule this season, what happened to being penalised for an engine failure due to the cost-cutting reasons cited. But I also never thought that an engine/gearbox failure prior to the race should penalise a driver. I think that any penalty should be applied during the race and apply to that race only, none of this waiting a week to find out if there is going to be a penalty (such as after Japan last year). Plus the penalties should be clearly defined (as I think you also noted recently) yes every once in a while there will be a situation that hasn't arisen before, but the stewards will get more time to debate on that issue if every other issue in the race has standard penalties which can be applied quickly and easily. On a slightly related but un-related note, I would like to see the regular race stewards back and for them to have at least an ex-driver and ex-engineer on the stewarding team, how many times have you heard ex-drivers disagree with a stewards decision based on their unique experiences from within the cockpit. I'm sure you'd be able to find some highly qualified people who were impartial enough to fulfil these roles. actually, didn't they used to apply time penalties ages ago? i think it may have actually confused people because the time and the on track position made it difficult for everyone to follow. but, they could employ a penalty like cart used to- either a drive through or a drive in and hold them at the end of the pit if a stiffer penalty is imposed. I'm not sure about point penalties. Take Hamilton's offense -- suppose that is a one point penalty, then it isn't really a penalty is it? Perhaps if you limit to say 5 and 10 point penalties then you're okay but that isn't fair. Five points for Force India is a helluva lot whereas five points for McLaren is nothing. Smaller teams get disporportionately penalised, which is wrong. I dislike time penalties too -- they can manipulated by a driver in front slowing down on a difficult overtaking track (or part of track). I've always felt penalties should only apply to the race in whcih they were committed, not future events. They could be time penalties, points penalties, monitary penalties or place reductions...whatever the stewards feel is appropriate. Maybe the stewards could look at Horsepower restriction as a penalty. This could be implemented during the race. For example, Hamilton's penalty in France could have been a 20 bhp penalty for the next 10 laps. Perhaps it could be based on straight-line speed per team (up to that point in the race or weekend), so smaller/slower teams would have a lesser bhp penalty that still gave them the same percentage of performance loss in relation to faster teams. Could something like this be controlled through the standard ECU? The standard ECU could certainly be used to decrease engine power by a set amount but that looks like an area that teams could fairly easily fins a way around. I am in favor of there being a range of different penalties as long as these remain fairly standardized according to the severity of the offence. My suggestion of docking points is just one way in which drivers could be discouraged from unfair or dangerous driving and was offered as an alternative to the grid position penalty. It is the delayed penalty that really concerns me, however, and I realise that there should be some way of penalizing offenses in which a driver is eliminated from the race, as in Hamilton's pitlane collision with Kimi. In such cases, time penalties are obviously unworkable. I agree very much with that Dave Spurr and John Beamer have said - much is wrong in both the rules and the penalties and simplification would be a good beginning to improving matters. Penalties should fit the crime. I have yet to hear of any crime which actually fits the penalty of a next-race-grid-penalty. I would be in favour of a warning-drive through-stop/go-disqualification-disqualification for multiple races system of penalties. Anything not fitting into that system would only be used if it was a situation where the above penalties either could not be applied or were excessive. An example would be missing out a corner on the fastest qualifying lap, which would be more fairly penalised by cancelling that time. Disqualification for multiple races - permission re-granted and reinstatement in race where crime happened if races hadn't happened (and the FIA would automatically leave space for an appeal before beginning a multi-race disqualification). Otherwise, compensation to be negotiated at the time according to what was probably lost. Interesting article and discussion. I think we have to accept that whatever punishment is meted out it is open to abuse - or, just as damagingly, accusations of abuse. Grid penalties are harsh but I think they are an effective means of penalising a driver. The real problem is the consistency with which rules are enforced. If Kovalainen got a penalty for holding up Webber at Magny-Cours, why didn't Raikkonen for holding up Kubica at Melbourne? 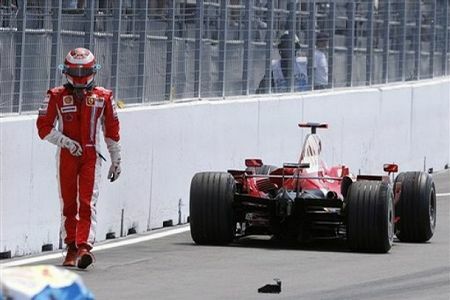 If Schumacher was called into the pits to have a loose barge-board removed at Melbourne in 2003, why wasn't Raikkonen summoned to have his flailing exhaust torn free at Magny-Cours? I'm not saying there is an attempt on the part of the stewards to favour one team over another (as some are), but there is clearly a lack of consistency. This criticism has been levelled at F1 for years - decades, perhaps. Keiths comment made me think, how do the stewards choose what penalty to apply? Do they look only at the rule book and then work it out from there, or do they have a database of all previous incidents that were subject to steward inquiries and the result of them? Like Keith points out there is usually previous precidence to most of these, I understand that the rules and penalties change over time but having full details of past infractions and the stewards responses will surely improve consistency. Just a thought. But then again like everyone else outside the stewards office (and Ferrari garage) I would have expected Kimi to be forced to pit to remove the dangling exhaust. Aren't the stewards literally different people every week? I thought the penalties themselves were Charlie's decisions, meaning they should be similar but aren't, but he's relying on a different bunch every week to spot these penalties, correct me if I'm wrong. The stewards are different people every week, which means the decisions are made by different people each race. Charlie Whiting is the spotter of incidents, so that's the same every week.